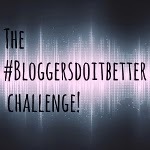 This week #bloggersdoitbetter is all about bloggers doing trends better. I have to admit I don't have my finger on the pulse for trends as I mostly just wear what I like and think looks nice rather than what I should be wearing.Still I checked out some magazines and was delighted to find that they were covering festival trends. Since I am super excited to be going to Boomtown Festival this year I dug into my wardrobe and recent buys to find the perfect festival outfit. I love all the Daisy prints everywhere they always remind me of Drew Barrymore or making daisy chains in school. I bought this dress from New Look a while ago but I love how light the material is and how swishy it is. Always makes me feel really girly and happy when I wear it. Festivals are all about easy to wear clothes that make you feel good. I teamed it with some black leggings, Denim vest, black lightweight cardigan and pumps with my misfits laces. All topped off with this super cute flower crown.Also loving this cat bag from eBay. Everyone knows by now wellies do not need to be boring and I love some leopard print. These were from Ebay. The cat eyed sunglasses are by Naked and Famous to keep those eyes from squinting in the sun or just to look damn cool. I saw this unicorn poncho on ASOS and fell in love and a grrrl has got to find a fun way to stay dry.